Choke Your biggest fear! 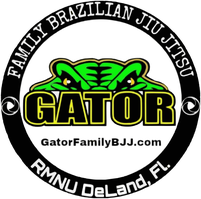 - Gator Family Brazilian Jiu-Jitsu, DeLand Fl. If you really want to know happiness and realize your dreams, you have to be willing to take a leap of faith despite being afraid. All too often, we hold back and play it safe in order to avoid becoming successful, feeling embarrassed, being hurt, or possible failure. What if Bill Gates had been frozen by fear? We cling to fear from our childhood experiences and become like Linus, from the cartoon strip Peanuts, clinging to his security blanket. It’s our responsibility to acknowledge, face, and dissolve our fear. Are you willing to start now, to dig for the courage to do all the things you were meant to do, but haven’t yet started? If the answer is yes, then read on! When you fear something, move toward it. Feel it, and breathe through it. Imagine a 250 lb guy moving towards you thinking your someone else, and he’s really mad. Now imagine you have been training Jiu-Jitsu. Taking a big guy down and applying a choke hold will allow you the upper hand, while not having to actually hurt you or the aggressor. Contact sparring will help you gain the confidence and techniques to defend yourself in that kind of situation. Fearful thoughts will attract more fear. Positive thoughts will attract success. Instead of expecting the very worst, try training your mind to expect the best. Make positive assumptions about your future. So many times we make things worse in our minds than the outcome really is. 3. Don’t give your time, attention, or energy to fear. Be innovative, take the initiative, go the extra mile. If you don’t take action despite your fear, opportunity will pass you by. If you want to win a Gold Medal, you first have to register for the competition. Paying your money is a down payment on success. You can’t half way jump off a diving board. Remember, there is no losing in Jiu-Jitsu. You win, or you learn. 5. Live vicariously through the victories of others. Use the success stories of others. Read about the success of Steve Jobs, Walt Disney, Steven Spielberg, and Oprah Winfrey. Take note of the courage they developed and follow their path to greatness. 6. Ask your family and friends for encouragement. My family see’s my strength when I forget it. They don’t hesitate to remind me of the trials and triumphs we have come through. They’re generous with praise and encouragement. Ask your loved ones to do the same for you. 7. Plan to be great. Step into your power and dream big and follow it up with calculated risks and deliberate action steps. Have no doubt about your success. Your dreams are at stake here! You have the power to do whatever it takes to break through any obstacles that stand in the way of yourself, your dreams, and your happiness.